Registration: Participants are required to register prior to the event. For registration, please click here. As regional managers begin to address the many effects of climate change and sea level rise in the Hampton Roads region, having accurate data and the ability to quickly and clearly communicate current conditions to the public will become increasingly important. From improving the accuracy of storm surge forecasts to tracking the frequency and intensity of flood events, generating new datasets will provide planners and managers with the information they need to prepare the region for changing conditions. There are a number of data-related challenges in the region for all of the four phases of the risk management cycle: preparedness, early warning, response, and recovery. A key issue in all four areas is data availability, and new capacity for the collection of environmental data with traditional sensors as well as crowd sourcing would be very valuable. Data related to the socio-economic processes in the context of risk management is very sparse and using crowd sourcing to collect more data could help address this gap. Providing planners and managers with detailed information about the region’s current conditions using new low-cost technologies, such as Intel’s new developer boards and the many sensors with which they are compatible, will improve the understanding of where flooding is occurring and the conditions that cause it, giving local communities more lead time to plan for higher water levels in the future. Operational real-time or low-latency services providing easily accessible information on environmental conditions, particularly conditions related to frequent flooding, would enable the population to better cope with the hazard of “nuisance flooding” and also support actions in the case of extreme flooding events. Combining this information with public facing maps will also help residents understand where flooding will occur and how it may impact their daily lives. In addition to displaying current conditions, the development of “What if” tools (gaming, simulation, and modeling) would support decision making on mitigation of flooding impacts and adaptation to sea level rise. A low-cost Galileo or Edison based sensing platform that monitors flooding and water levels in critical locations and communicates current conditions to regional managers. Soil and air moisture sensors that can be placed in hard-to-access places, like crawl spaces under houses, to alert homeowners of conditions that may cause health concerns. A web-based mapping platform that uses this information to track current conditions and alerts the public when road closures will impact key travel routes. A smartphone or web-based app that uses flood prediction models to alert users if their car is parked in an affected area and suggest an alternate parking spot. Web-based mapping tools that help users explore the potential impacts of future conditions on current infrastructure, development, and land use decisions. Despite the creation and distribution of numerous climate related datasets over the last five years, local governments and conservation organizations in the Chesapeake Bay have not made significant steps towards incorporating this new information into local planning efforts. The implications of climate change and sea-level rise are not always included in the current planning process and short term decisions about land use are often made independent of their future consequences. Few, if any, tools are designed to help communities understand and quantify the long-term effects and costs of developing in certain locations, making it difficult for planners to justify avoiding, or limiting, growth in vulnerable areas.The Hampton Roads region, located at the mouth of the Chesapeake Bay, is one of the communities most vulnerable to the impacts of climate change and sea-level rise. Coastal communities throughout the Chesapeake Bay, and around the world, are constantly making decisions about where to allow construction and new development, as well as where to protect open space for public enjoyment and natural resource protection. Numerous concerns influence these decisions, however they are often focused on short-term benefits that do not consider what the landscape might look like beyond the next thirty years. These decisions can have long-term implications, however, as communities are allowed to expand into areas that will be vulnerable to flooding and expensive investments in public infrastructure are placed in areas that will be impacted by a rising sea level and a changing climate. In addressing these critical needs, the results of the Hackathon will hopefully be transferable to other locations throughout the Chesapeake Bay and around the country. These tools will help local governments and conservation organizations incorporate new climate data into efforts that reduce a community's vulnerability while offering greater protection for critical coastal ecosystems. The target audience for the Chesapeake Hackathon will be students and professors from local colleges and universities, local programmers, and members of the Code for Hampton Roads Brigade, as well as other local Code for America groups located in the Mid-Atlantic (Northern Virginia, Washington, DC, Philadelphia, Raleigh/Durham/Cary). Subject Matter Experts will include experts in climate change and sea-level rise, planning and zoning, community development, and conservation targeting. Using the model of Intel's Code for Good Program and their National Day of Civic Hacking, this event will bring together developers, designers, and subject matter experts for two days to focus on creating software-based solutions to a social problem, in this case, climate adaptation and planning in coastal communities. 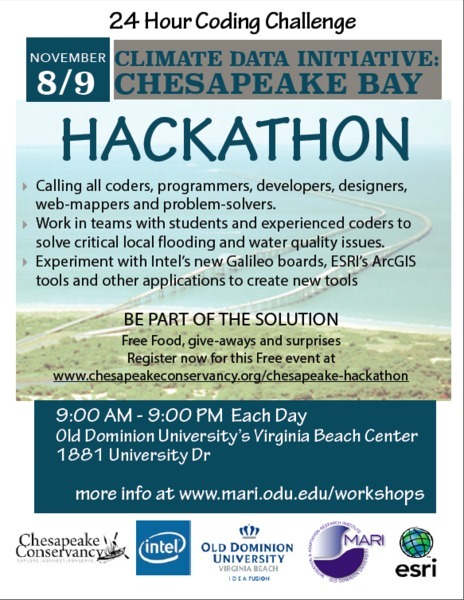 The Chesapeake Hackathon will focus on creating tools that allow local governments, planning districts, and conservation organizations to better understand where the impacts of climate change and sea level rise will be felt the greatest. Using ESRI's ArcGIS software and ArcGIS Online web-mapping platform, Hackathon participants will be able to incorporate geospatial data hosted through the Climate Data Initiative into planning decision support tools and scenario planning tools to better visualize and understand the long-term implications of planning decisions and how proposed, and existing, development will likely interact with the various impacts of climate change. An additional focus will be put on identifying ways to incorporate Intel's new Galileo developer board to monitor changing environmental conditions and provide planners and local organizations with a low-cost way to collect additional data that will be helpful in understanding, monitoring, and quantifying the effects of climate change throughout the Hampton Roads region. Potential applications include monitoring water temperature, salinity, and acidity, measuring soil wetness in coastal areas to determine flooding potential, and monitoring air quality. Development work using Galileo during the Hackathon will also help propel the Chesapeake Conservancy's efforts to establish low-cost water quality monitoring technology that will be used throughout the Chesapeake Bay. Providing local communities with low-cost, real-time monitoring capabilities, using the Galileo system, will also increase their ability to monitor and quantify changing conditions to better understand when and where the impacts of climate change will be felt hardest. By tracking metrics such as water temperature, salinity, and acidity, measuring soil wetness in coastal areas to determine flooding potential, and monitoring air quality, local partners will have an early indication of when action will need to be taken and will have the data needed to support sometimes difficult management decisions. Ideation Meeting on July 11, 2014: The details of the challenges for the Hackathon were worked out during an Ideation Meeting. There are a number of data-related challenges in the region for all of the four phases of the risk management cycle, that is preparedness, early warning, response, and recovery. A key issue in all four areas is data availability, and new capacity for the collection of environmental data with traditional sensors as well as crowd sourcing would be very valuable. Data related to the socio-economic processes in the context of risk management is very sparce and using crowd sourcing to collect more data could address this gap. Operational real-time or low-latency services providing easily accessible information on environmental conditions, particularly conditions related to frequent flooding, would enable the population to better cope with the hazard of “nuisance flooding” and also support actions in the case of extreme flooding events. For these extreme events, more and improved response support services are urgently needed to reduce the disaster risk. In general, improved access to basic knowledge available in a number of public databases would be of value to many societal stakeholders in the region. The development of “What if” tools (gaming, simulation, modeling) would support decision making on mitigation of flloding impacts and adaptation to sea level rise.